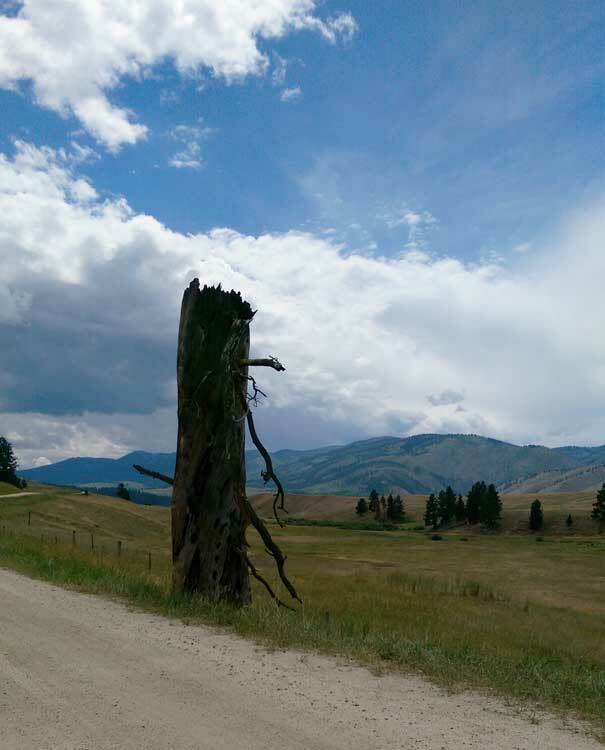 This last week I saw this dead tree along side the road while driving in Ravalli county Montana. As you can see this must have been a huge tree and it is now full of holes where animals and birds have made their home. I had to stop and wonder about the stories this tree could tell about the world. Recently I was in a motel that was full of people who had come to fish in the the local world class rivers for fly fishing. Each morning I was listening in the breakfast room about how the hotel did not have all the premium channels they had a home, lack of cell phone coverage, that the only Starbucks in the county was a kiosk in the grocery and other perceived lack of amenities in their vacation destination. I listened as they describe the community of the folks who were their hosts while they were on vacation. I found myself thinking lots of unkind thoughts about them. It was then that I realized that I was just like all the people who were frustrating me. I was judging them. We don’t have a million people yet in Montana, though we are getting close. When you don’t have critical mass most national companies require, they don’t give a rip about providing services to you. A business in in the business of making money. If you live an area that is so sparsely populated that you don’t get mail deliver it is, highly unlikely a cell company can justify the cost of a cell tower, or their will be national retailers available. There are many trade offs we make to live in a place like Montana. Some are obvious and others not so much. Most Montanans have been to your cities and some of us have even lived there for a period in our lives. We appreciated some of what you had to offer in arts, food, and other services. Some of what you live with as normal we can not imagine living with such as traffic, density, noise and other things. All of this just amounts a different point of view. We have prioritized things differently in our lives and are willing to make different sacrifices to have some of those top priorities. Neither is more right or more wrong than the other. No amount of put down or arguing is going to change either person’s point of view. Change never comes in the midst of confrontation. When I feel folks are passing judgment, I want to remember to not pass judgment on others because I am not them. I do not know what road they have traveled in life to be at the spot they are currently stand at. The best way to do that behavior myself. Let them remember their encounter with me as some one who did not pass judgment and maybe, just maybe it will make a difference on their lives as well. Note: This was a piece I wrote several weeks ago and had to let perk while and tweak it a lot to hopefully get right. I hope you found it insightful and gave you some food for thought. This week there was a woman whose path I crossed many times. When I would drive by her, she would be sitting in her car gazetteer in hand, appearing to be studying it intensely. Later she would drive by me while I was recording survey data or looking at my maps picking my way to my next location. We finally met up when we were both having lunch at Calf-A with our maps and notebooks spread out on the table while we ate. We laughed because we had smiled and waved at each other, so it was almost like we knew one another before we had introduced ourselves. This woman was also doing survey work also. She was a grad student who was working on a project for the National Trust for Historic Preservation. Montana’s rural school houses were listed in 2013 as one of the 11 most endangered places. She was documenting one and two room school houses in Montana.I love history and would loved to have spent a day working with her. The old school houses often tell the story of rural communities not just the teacher, but also the students and their families, their hardships and their joys. Montana still has lots of functional one and two room school houses, but they are considered endangered as like the rest of the country we become more urbanized and families become smaller. As schools are combine and abandon they become at risk for vandalism or destruction, if a new purpose is not found for them. It was fun to listen to this woman tell about coming from Tennessee to do this project in Montana. How she was discovering so much as she traveled around finding remnants of old school houses many of them still standing. She told me how where she was from the old school houses were no more than a place on a map. Here our dry climate has managed to keep many of the old buildings still intact. We also have many one room schools that were started so many years ago still in use. She told of the feeling of walking into a school that was a clapboard building covering the original log school and seeing computers. The past supporting the future and changing to do so. 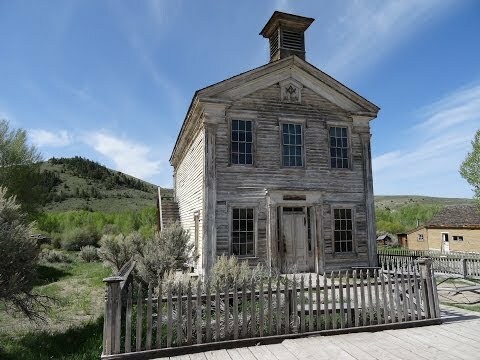 The school was on the lower level and the Masonic temple was on the second level of this school in Bannack, Montana. It has long since been abandoned. I would cross paths with her the rest of the week. Next week I will be another county but I will think of her each time I drive by another school building wondering if she got a chance to visit and document that one. This school in Camas Prairie, MT was closed in 2012. I drove by this school a couple weeks ago when I was in Lake County. Last week it seemed was rainy everywhere, and Montana was no exception. I blogged earlier about the rain and my field work last week. As I was taking one last look over the photos I had taken before I packed up again to head out again this week. I noticed that there were two photos that reminded me of the dramatic difference that a day, an hour or a minute can make. Most of the week I was rained on in some form, from a light mist to pull off and stop because the rain is so hard you can’t see. There were a few photos taken when the rain stopped and most of them still had grey clouds and threatening skies. Yet I did have one photo where the sky was blue, the clouds were white, the grass was green and the road was calling for me. Life was pretty amazing. The road is calling my name. The other was a photo that grabbed me was the one I took sitting in the cab of my truck on my last day. 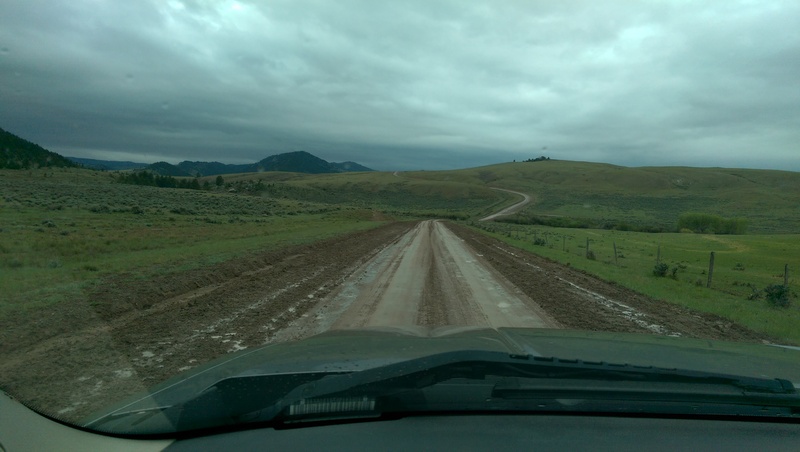 I had been driving down this road that was getting progressively worse while the rain continued to fall. I stopped in the middle of the road and mentally regrouped. 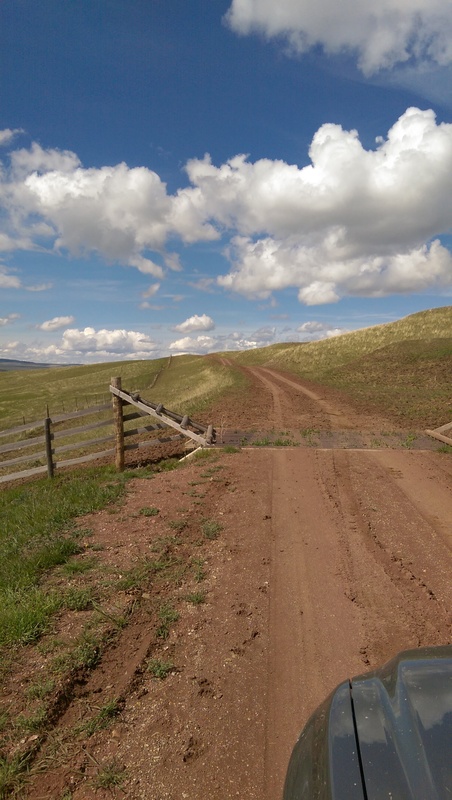 Though I could see for miles in all directions, I was alone, I had been praying to not meet anyone on this road because to get off the proven tracks was soft mud. I would drive down this road for another few miles with it getting progressively worse and began to look for a place to turn around. At eight miles from the paved road I would finally come to place to turn around without risking getting stuck and having to walk out. I wrote off the last gypsy moth trap as impossible to safely set. It was a low point to admit defeat, to be so close and not make it. Yet maybe it wasn’t. I did not get stuck. I did not have to walk out in the rain and I got all but one of my traps set. Maybe there are no high points or low points, just points of view. Miles from anywhere or anybody.